the accuracy of results derived from this or any other spoke length calculator! To download, click and hold, select "Save this link as..."; Select "Source" from the Format menu. Merci à Vincent Vallet pour la traduction. SpocalcExpress has no hub database, no rim database, no instructions, no macros -- just the calculations that operate on the numbers you enter. Thank Mark Schlueter for this great idea. SpocalcExpress is just like the full version of Spocalc, but less. Enter one set of hub and rim dimensions and SpocalcExpress gives you the spoke length for radial, 1, 2, 3, 4, and any other cross of your choice. Great for Quicksheet on your Palm. Spocalc is a free Excel spreadsheet I made that calculates spoke lengths for wire-spoked wheels. There are lots of other spoke calculators on the web (see the list I've assembled). Some require you to measure your own rim and hub, but Spocalc includes a database of over 350 hubs and 500 rims. The Spocalc database is also user-modifiable and expandable so you can add more rims and hubs. Some other spoke calculators require you to re-enter the rim and hub dimensions again and again to get different lengths for different numbers of crosses, but Spocalc automatically gives you spoke lengths for 0, 1, 2, 3, 4 and one other cross of your choosing (even a decimal number! Why would you want to do that?). Having several lengths can come in handy. Print out Spocalc's calculator sheet and take it with you when you buy spokes. If the shop doesn't have the right length for, say, three cross, you can take a glance at the sheet and decide if you could use four cross instead. I wrote this spreadsheet using Microsoft Excel 5.0 but it has now been updated to Microsoft Excel 97-2003 and you must have Microsoft Excel 97 or higher (Windows, Mac or Android), LibreOffice Calc (free download, Windows or Linux, also see page about format conversion), or Gnumeric (free download, Linux only). Spocalc has a few macros to help speed data entry. When opening Spocalc, you must choose "Enable" if you wish to use these macros. If your virus checker disables them you can still use Spocalc without the macros - you just have to type in the numbers by hand. If the Developer tab is not in the ribbon, then in the File tab, click Options, and then the Customize Ribbon category. In the Main Tabs list, select the Developer check box, and "OK."
Then, in the Developer tab of the ribbon, click on "Macro Security." In Macro Security, click on "Disable all macros with notification." This choice will let you decide whether to run macros or not: a message bar may still come up, warning that macros are disabled. If so, click to enable macros. Now to use a macro, first select a hub or rim by name, as described below. Then in the Developer tab, click on the Macros icon. : A list of macros will appear. Click on the appropriate macro. Versions of spocalc with macros for OpenOffice have been prepared by Mike Sherman. As you can see, by entering the hub and rim dimensions once, you get spoke lengths for all crosses automatically. Although front wheels are usually symmetrical, which would make the "Left Front" and "Right Front" tables redundant, I've provided separate left and right tables in case you are using a disc-brake hub or other dished front hub. At the bottom you can see the tabs used to view the instructions and the hub and rim database sheets. While you may certainly type in the numbers by hand, here you can see how to use the macros to enter all the hub data for you. Important macro tip: you must first select a cell in the "Select a Hub" column before using the macro to enter the data. The rims sheet works just like the hubs sheet: select the cell containing the rim you are using, then click on the appropriate Macro (from the Tools menu, or in the Developer Tab of newer, beribboned Excel versions) to enter the Effective Rim Diameter (ERD) on the calculator page, or type the ERD number into the calculator page by hand. additional ways to measure hubs and rims. Measure twice and select spokes once! d, flange diameter is measured between centers of opposite holes in the hub flange. It is usually between 38 and 67 millimeters. 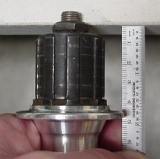 Note that it is NOT the outside diameter of the hub's flange. Left and right flange diameters are often, but not always, the same. Small errors in this measurement are important only with radial or near-radial spoking. S, spoke hole diameter, is the through diameter of any spoke hole. It is usually 2.6 mm. Measure OLD (Over Locknut Distance). Not a lot of precision is needed in the width dimensions. A few millimeters' error in width will only lead to a fraction of a millimeter's error in spoke length. I usually measure A and B dimensions by holding the hub locknut against a flat surface (like the edge of my workbench), then measuring from there back to the hub flange with a ruler or caliper. Note that you must hold the loc nut (not the axle end) against the edge. Of course, I use two hands for better accuracy. In this photo one hand is working the camera! Effective Rim Diameter (ERD) is the dimension you type into the spreadsheet for "ERD, effective rim diameter". Of all the dimensions you actually might measure, ERD is the most critical dimension affecting spoke length, so it makes sense to measure it a few times at different places around the rim. Always count to make sure you use spoke holes that are actually opposite each other! John Allen's article describes two other ways to measure ERD. It isn't a bad idea to double-check! Off-Center or Asymmetric rims make spoke tension more nearly equal when a wheel is dished. These rims require a slight adjustment for spoke lengths. I don't know enough about Excel to make Spocalc smart enough to compensate for rim offset, but I have two work-arounds: the easy way and the exact way. The Easy Way: Calculate spoke length as if the rim were symmetrical. Then add 1mm to the right side and subtract 1mm from the left side on rear wheels, or add 1mm to the disc side and subtract 1mm from the non-disc side of front wheels. - Measure the rim width (W) and divide by two. This is the rim half-width. - Measure the distance from the near sidewall to the center of the average spoke hole (L). - Subtract this number from the rim half-width. rim offset = (W/2) - L.
- Subtract rim offset from the left flange width. Spocalc automatically displays the new spoke lengths. Fatbike rims typically have the two rows of spoke holes far from the centerline. With some hubs, there will be hardly any bracing angle unless you cross spokes over to the far side of the rim. An e-bike hub motor may have narrow spacing between the flanges, so crossing the spokes over may also be useful. Use a rim whose spoke holes are not angled sharply toward the flange on their side. Add the offset between the centerline and the far row of spoke holes to the hub flange spacing when calculating spoke length -- same calculation as the "hard way" for asymmetric rims, described above, except that you have to do it separately for each side of the rim. . The spoke lengths calculated in Spocalc are based on pure 3D trigonometry: they are exact. So unless I've made a mistake in the formulas, any error must lie in the hub or rim measurements. 2. Hub dimensions are less critical: errors here have less effect on spoke length than errors in ERD. With tangential lacing (several crosses, like three or four), flange diameter (d) is less critical than flange width (W). With radial lacing (not advisable with hub brakes or rear wheels) flange diameter becomes relatively more important. 3. Spoke-hole diameter (S) is pretty inconsequential. Errors in spoke-hole diameter contribute directly to errors in spoke length, but since the errors are usually so small (much less than 1 mm) they rarely make a significant difference in spoke length. Many formulas ignore spoke-hole diameter entirely. 4. Also, it may seem obvious, but check to be sure you entered the correct number of spokes (N), and that you read the spoke length from the cell corresponding to the correct number of crosses. I've made both those mistakes before! 5. You can always download a current copy of Spocalc or SpocalcExpress from this page. This will fix problems like accidentally typing over hub or rim dimensions on the database sheets, or typing over formulas on the calculator sheet. Check spoke tension by ear, by John Allen. Sheldon Brown's excellent Wheelbuilding page. Tom Ace's beautiful "3 leading, 3 trailing" pattern. Hed Wheels. Complete aerodynamic drag numbers tabulated. Humphries aero wheel summary. More aero drag numbers. Rowland Cook's unusual lacing patterns. American Classic - site map. Lengths for many cross patterns with one data set entry? Damon Rinard's Spocalc with Excel macros yes yes yes User updatable; no longer updated by Damon Rinard yes Excel is also available for Android devices! E-bike calculator yes no no yes no Mostly for e-bike hub motors and calculates with paired spokes but please read this page. Pete Gray's Spokulator yes Requires Java-enabled browser, so, not tested. spokelength.com yes no no Enter rim and hub dimensions yes Only a single flange spacing number, probably assumes equal spacing both sides. Spoke Length calculator for Mac yes yes yes ? No way to test, no Mac here!